The SPM-612 power manager – the “heart” of the system. © Ultralife. Q: What makes Genesis greater than the sum of its parts? A: Genesis is a system that addresses size, weight and power across the board. Genesis allows the soldier to spread that power load out and that is translated through the power manager. Batteries are being carried today that have a Vietnam-era form factor. We want to allow soldiers to carry the gear that he needs, wherever he wants it, and to address the load carriage issues that we are seeing across the battlefield. It is tailored to the completeness of what a special operator would want but it is also scalable. If you look at an end user in the “Big Army”, he’s going to have a handheld radio, multiple antennas and he may need an amplifier based on his role as a communicator or the ground force commander. Genesis accommodates that through the power management system. There is lot of vapour ware out there. Ultralife pride ourselves as being one source for many solutions so we can provide the whole package as an offering instead of having to deal with multiple vendors piecing it all together. We know that ours is interoperable, we have worked with Protonex to make sure it supports the current draw for the amplifier to support the radio. The Genesis package itself is sustainable and it works. Q: What are the power management advantages? A: The six port Power Manager enables bi-directional in or out DC power. You can take as much or as little equipment as you need depending upon the parameters. Let’s say a soldier has two radios, one of which is for ground communications, the other to talk to an aircraft. At that point you take two of the six ports and you no longer need batteries for those radios. Instead you only need to use a small adapter to power them through one source. That source will also allow you to swap batteries. You can have one battery that is fully charged and another that is not. Swap the weaker for the fully charged and you keep your gear running at all times. You don’t have to power down, you can remain operational throughout. Additionally if the soldier would want to talk to another group further away, you add in the 20-watt A-320 amplifier which runs on the same batteries that are powering the radio. The A-320 can run on a single battery. The net result is that you have a bank of batteries or maybe even a larger battery - whatever the user requires - powering all of the equipment. The Power Manager acts as the central hub for the entire system: recharging batteries, distributing and optimizing power and even harvesting power from peripheral sources. We give the user the flexibility to configure their systems for mission time or the chemistry that they have in their arsenal. The system can also scavenge power from a multitude of areas whether it be a fuel cell or DC input from a tactical vehicle. We are actually very close to having a power strip. What that does is allow the soldier to plug in to the vehicle or aircraft, stay charged up for the entire transit on to the target and then keep all of their gear charging through the Power Manager. This power hub allows the soldiers to remain flexible during mission transit and if there is a follow on mission and they go back into the helicopter they can recharge while moving to the next target. This speaks to Ultralife’s general communications capabilities in that we can incorporate this power hub into any one of our communications systems. It doesn’t matter if it is a COTM or a BLOS system because the soldier can be tethered directly to that piece of equipment through audio and power and remain charged up and communicating the entire time. The Power Manager software becomes part of your pre-mission planning. How much energy do I need to support this mission? You determine the need at that point on you can take out excess equipment keeping only what you need for that mission. If anybody asked us to power a new gadget, if it falls between that 4-34v range then Power Manager can support it. We are providing the flexibility for the end user to add as they need. The Power Manager is miles ahead of everything else on the market because of its size and flexibility of its voltage range. 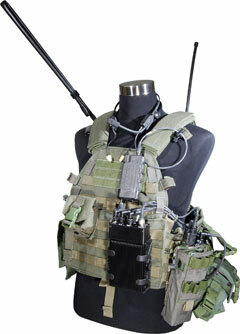 Tactical vest carrying GENESIS kit. Q: How do you bring in other pieces of equipment? A: The big piece there is modularity. If you have an Elbit or a Selex radio, we can build an adapter to support that radio. Producing a new adapter would take only a matter of weeks. Based on the technology we have in hand, it should be a pretty simple operation. Obviously it’s easier for us to do that when we work directly with the radio manufacturer. Q: What’s the difference between the Protonex 611 and 612 in Genesis? A: The only difference is the screen functionality on the 612. In some cases users will want to look at that power manager and reprioritize ports during the mission and/or diagnose where you actually stood within mission time. Without that screen, you have to program through one of the side ports on the 611 unit. Q: What are the cost implications for a system such as this? A: A lot of users come back with half a battery after a mission and they are going to throw them away and get a new one. At this point you can look at what energy is left in the batteries and keep some of them thus saving the military a lot of money. Q: Are there likely to be any changes in energy density through new chemistry? A: Presently, there are some ongoing efforts at Ultralife in regards to CFX. We expect significant strides forward in the near future. Q: The Genesis system has other capabilities, please explain. A: As a former user myself, I know that Special Operations personnel throughout the world are frequently reaching out to Command and Control and Tactical Operation Centres via Satcom. To address this need we include Satcom antennas. The A320DPA has a dual port adapter that gives you the flexibility of having both a LOS antenna as well as the satcom. In addition, the Dual Port Adapter provides LNA in the Satcom range. Q: What has been Genesis’ involvement in trials for users? A: There is strong interest in Norway, New Zealand, Latin America and throughout the Asian region. User trials are set to kick off in Malaysia and Singapore. We have also been asked for sample units to start the testing in the USA for the Net Warrior programme. Q: What is your commercial strategy? A: We have always focused on both the end user communities and opportunities where we can provide support to OEMs and partners. There are only a few companies out there that are addressing power management with the same emphasis as us. A lot of new technology is also coming out so there is a lot of experimentation in terms of size, form factor and power requirements. Ultralife strives to get into programmes early on when they are being developed, as well as when contracts have been awarded and we can partner to support the effort. Early involvement obviously allows us to help mould the requirement around what will be the optimum solution to the soldier. 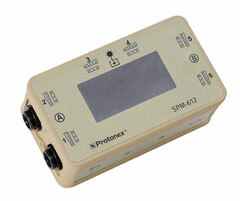 Regarding the Protonex Power Manager, it has gone through much iteration in order to arrive at where it is today. And further development is always ongoing. Ultralife can also prime for a programme as well as add accessories which could be the computer, the radio or whatever else is required. We can provide many solutions as well as with a radio manufacturer to provide the complete package.